Here's a card I came across that we did back in April but I just love it so I thought I would still share it with you. The sentiment and border image are retired but you can certainly find something that would work! This is a center step card with the butterflies in the center floating above the sentiment. This was done by using small strips of window sheets and securing them to the back of the "step" where the sentiment goes. Here is the inside of the card which gives you plenty of room to sign and write a birthday wish. 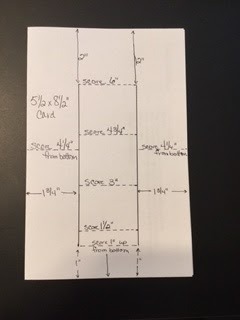 Here is a picture of the measurements for cutting and scoring for this card.